Islam Around Us: Five killed in Pakistan market bombing. 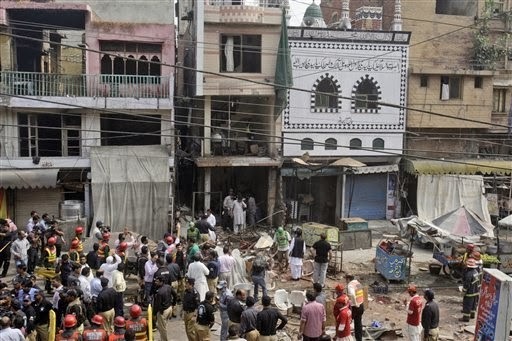 Five killed in Pakistan market bombing. QUETTA |Pakistan | 10 Oct 2013 :: A bomb exploded outside a police station in a crowded market in southwestern Pakistan on Thursday, killing at least six people, police said. The blast in Quetta, the capital of Baluchistan province, also wounded at least 30, said police official Mohammed Mohsin.In a telephone call to an Associated Press reporter, a spokesman for a small separatist group called the United Baluch Liberation Army claimed responsibility for the bombing. Mureed Baluch said the attack targeted the police station in retaliation for what he said was authorities’ restricting aid to areas of Baluchistan hit on Sept. 24 by a massive, 7.7-magnitude earthquake. The earthquake killed at least 376 people. Aid efforts have been hampered by repeated attacks by militants against the Pakistan military as it carries out relief operations. Baluchistan is home to separatists who have waged a decades-long insurgency against the government. Also Thursday, a bomb exploded in a busy market in the eastern Pakistani city of Lahore, killing one person, said police official Raj Tahir. The bomb, which was planted in a restaurant in the market, also wounded 11 people, he said. No one claimed responsibility for that attack, but suspicion will likely fall on the Pakistani Taliban and their allies. Islamic militants have carried out scores of attacks throughout Pakistan, but Lahore has been relatively peaceful in recent years. In the northwestern city of Peshawar, five members of a tribal police force were wounded when a roadside bomb exploded next to their vehicle on the outskirts of the city, said a police official, Mir Hassan Khan. The officers were returning from protecting workers who were administering polio vaccinations, and Khan said he suspected they were attacked in retaliation for their anti-polio efforts. Pakistan is one of three countries where polio is still endemic, and the government has carried out an intensive effort to eradicate the disease. But the vaccinators and those who are supposed to protect them have repeatedly come under attack. China arrests 139 Muslims for urging jihad. Iraq bombing kills eight: officials. Iraq suicide blasts 27 including children killed. LoC firing in Kashmir today . Russian embassy in Libya attacked.